How Many Blood Cells Fill a Mosquito? How many pigeons would you have to stack in order to reach the top of the Statue of Liberty? How long would it take a car to drive to the moon—at 65 miles per hour? The answers to these and other questions can be found in Wacky Comparisons: Wacky Ways to Compare Size. I can’t figure out why the cover of the book in my hand is different than the ones I see online (same title, same authors, same publisher—a mystery!) but the wonderful premise remains the same. 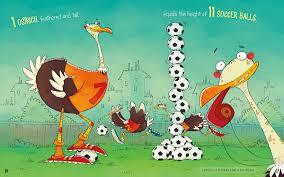 The authors use all manner of comparisons to describe height, length, and volume. Other books in the series include How Heavy?, How Long?, and How Tall? But the best thing about Wacky Comparisons is that they inspire students to write their own. Imagine an assignment that asks students to describe the height or weight of something in at least five different ways. How tall was a Tyrannosaurus as measured in bananas, or paper clips, or average first graders? How heavy is a cow? How heavy is a cow when weighed in marshmallows? Such questions spark both imagination and good mathematical thinking. But picture book activities need not be limited to primary grades. Older students can be challenged to generate equations to calculate given comparisons, or to graph changes that occur in one variable based on changes in the other. Consider comparisons that require complex exponents, with help from the Scale of the Universe data. 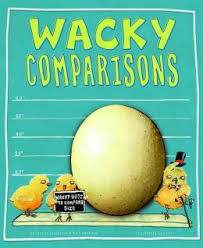 Wacky Comparisons are, indeed, wacky but they also provide fine opportunities for both mathematical conversations and imagination. If your students generate some wacky comparisons, we’d love to hear about them.